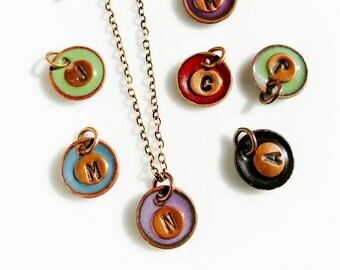 Announcement Jewelry for color lovers! The style is sometimes sophisticated, sometimes boho, sometimes simple and sometimes sweet -- but always made personally by me with a love of expressing colors. I use all materials made in the USA and I'm located in Ohio. I am truly a local small business owner and I put care and attention into everything I make. If you love color too, or you know someone who does, and are looking for that perfect unique and meaningful gift then you've come to the right place. Welcome! And, if you have an idea for something with a color combination I don't already have, most certainly, let me know! I am very open to working on projects together to come up with exactly the unique and memorable gift you want. You can contact me easily by clicking on the "Request a Custom Order" button in any listing or by just sending me a private convo. Thank you for visiting and I wish you lots of color in your life! Jewelry for color lovers! The style is sometimes sophisticated, sometimes boho, sometimes simple and sometimes sweet -- but always made personally by me with a love of expressing colors. I use all materials made in the USA and I'm located in Ohio. I am truly a local small business owner and I put care and attention into everything I make. If you love color too, or you know someone who does, and are looking for that perfect unique and meaningful gift then you've come to the right place. Welcome! These earrings are amazingly beautiful. The colors are vibrant and they almost appear to glow. They are very lightweight and add a surprising and small pop of color. Newest color blend is here! It’s called, “Court Jester” because it’s full of dramatic and happy colors. It’s a gift under $25 too! My simple and sweet Hiking with Dogs necklace comes with your choice of color for the enamel heart! 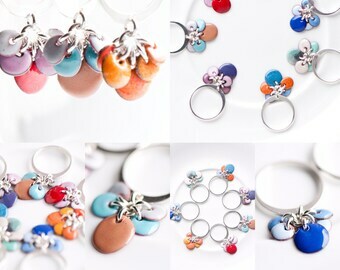 Brand new in the shop - flirty, fun and festive colorful dangle rings! Perfect for an upcoming holiday party. I can do other colors too if you have an idea of your own idea. What would you like? I punch out, or cut, shapes from copper sheet and I make all my own ear wires with sterling silver wire. Firing station. You can't see the ventilation fan, lung protection mask or fire extinguisher. Safety is a priority. I use sturdy tins to ensure safe travels and pretty pouches so you can gift them to a friend or maybe just your self! For rest and rejuvenation I love hiking in the Cuyahoga Valley National Park with my best buddy Cooper. The quote that started it all. 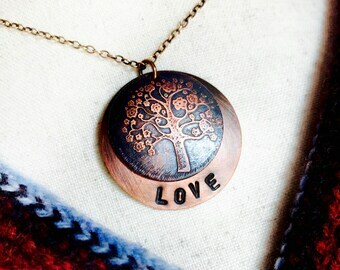 Blooming Enamels is handcrafted boho style jewelry for free spirits of every kind using copper enamel, bronze, brass and silver - and by torch fire enameling, hand stamping and etching. Blooming Enamels is colorful enamel earrings, family tree of life necklaces, personalized paw mom jewelry, and handmade initial charms. Of course it is much more than that and it is, like life, always evolving. Hello, my name is Melissa, and welcome to Blooming Enamels! I'm so glad you want to know more about me and my jewelry. I began my work career as a social worker. I have a master's degree in that field and it is still my, "day job." I love the field, but, as anyone who has come close to the field knows, it draining - and that is where my Etsy career began. Several years ago I wanted to escape the stress of my day job and so I proclaimed, "I just want to take pictures of pretty flowers!" and that's what I did - lol. I was still working in social work full-time but all of my off hours were spent either taking pictures of flowers and nature or working with and editing those pictures. It was lovely, relaxing, sensitive, sweet, colorful and grounding - and I loved it. I opened my first Etsy shop around 2010 where I sold prints of my photos but mostly 5" x 7" framed greeting cards I made by hand. I called it Bloom Spirit Expressions. At some point I wanted to expand my creative skills and that's when I, very randomly, stumbled upon a torch-fire enameling book. I don't usually purchase books (I have an incredibly good library system where I live) but this one intrigued me enough that I did buy it right then and there. I went home and got lost in the pages that showed beautiful bright colors (similar to my photography) combined with a unique quirkiness (*not* similar to my photography) - and it all felt very right for me. I took some time to learn more about the torch-firing process by researching, reading, YouTube videos, taking an online course and then finally one day I just jumped in by setting up my work station and firing up the torch. It was a love connection! 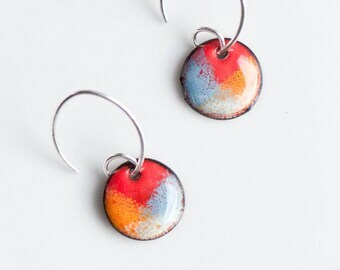 I opened Blooming Enamels in 2012 to sell copper enamel jewelry created with the torch. And now you find me today! I am still working in the social work field, and I still *adore* the torch-firing process, but I am learning and growing more and so my jewelry-making skills are expanding to now include more metalwork, hand stamping and etching. It also uses more symbolism and personalization which, in coming full circle it seems, is a natural extension of my social worker self and interest in the human condition. 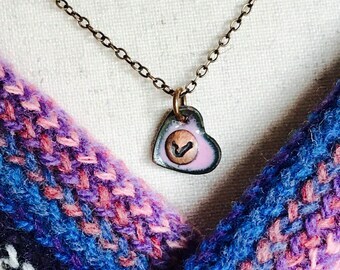 I work out of my home studio, accompanied by my loyal and faithful best friend Cooper, to make jewelry for you that is colorful, down-to-earth, unique, unpretentious, high-quality and meaningful. I hope you can find something you like. If you have any further questions, or you have an idea for something specific and unique to you, drop me a line and let me know. I'd love to make something for you. I am a self-taught jewelry-maker, photographer, graphic designer and small business owner -- but I am formally trained in social work and still work in that field. My main artistic aesthetic is bright, vibrant, happy colors and simple silver lines. Hello! Welcome to Blooming Enamels. All aspects of Blooming Enamels creations including color choices, enameling, stamping, etching, metalwork and wirework are completely handcrafted and handmade by me. I am self-taught in the jewelry field and it has been quite fun learning the process. Since most of the pieces are made-to-order individually there will be serendipitous variations. That’s the joy of handcrafted jewelry and I am proud of the lack of "cookie-cutter" style my jewelry has. Please know that you will only receive something that is completely made with love and care and close attention to detail. I do not send out anything that doesn't meet my high standards. •	I am proud of my creations so I do everything I can to ensure that your order is in the condition in which I would want to receive it myself. If, for some reason though, you are not completely satisfied with your purchase, please contact me within 7 days of receiving the item through Etsy Conversations so that we can discuss how to resolve the situation. Any refunds or exchanges will happen once I receive the returned item in original condition. Shipping fees are not refunded. •	Etsy takes care of all payment activity and keeps your information secure. I never receive your credit card information. •	I accept Visa, Mastercard, American Express, Discover, Apple Pay, Sofort, iDeal, PayPal and Etsy gift cards/credits. •	Payment must be received at time of order. •	For Ohio state residents I need to charge a 8% sales tax. It is calculated automatically at checkout. •	All ready-to-ship orders are processed and shipped within 1-3 days of confirmation of payment. •	Made-to-order items will take longer – please allow 3-5 days for notification of completion and shipment of your order. Please note that this does NOT include shipping times which are out of my hands. •	I ship via US Postal Service First Class mail. Priority Mail shipments are based on business days and *don't* include weekends. •	Multiple items purchased at the same time ship for a combined fee. •	I use only high quality packing and shipping supplies so your order is safe in transit. •	Blooming Enamels items can be shipped to anywhere in the world but you are solely responsible for any duties, charges, taxes, mishaps or non-deliveries due to any and all customs issues specific to any county outside of the U.S. Shipping times could take up to a month or even longer depending on where you are. I do not consider an internationally shipped item to be un-delivered until six (6) weeks have passed from the time of the Etsy shipping notification date. • I ship all items, both within the U.S. and internationally, with tracking numbers and/or custom form numbers. Any requests for refund due to non-delivery must include a proof of non-delivered status according to tracking numbers and/or custom form numbers. •	I use copper, sterling silver, vitreous enamel, brass, bronze and German silver. Very occasionally I will use iron. The glass enamels are lead free. I also use black rubber necklace cords. I package the smaller enamel items in a little tin to ensure safe transit. The larger and more durable metal items are safely wrapped in multiple layers of tissue paper sealed with an attractive Blooming Enamels sticker. Additional gift wrapping with a gift card is available upon request. Everything is sent in a bubble mailer. I would love to create a meaningful customized piece for you to give to someone special in your life - or maybe just to honor the specialness of you! That's one of the best parts of the handmade world and of buying from a small business owner who takes pride in her work. To get started click on the "Custom Order" button, or simply send me a private conversation, to tell me what you have in mind. I'll maintain close communication with you throughout the process, and I often send photos to show you options or variations. 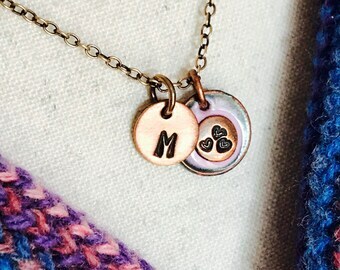 It is a collaborative process where together you and I create something unique and personalized so you can surprise and delight the special person you are gifting, including if the special person is you. :) Let's go! I have multiple sizes for many of my items. I try to provide specific and detailed information regarding those sizes in the listing and/or in accompanying photos. I use both imperial and metric sizing because we live in a big world. If you still have questions, or aren't quite sure which size to go with, drop me a line and we'll figure it out together! 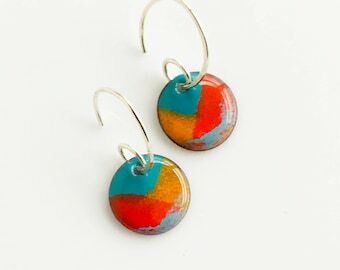 I like durable and sturdy so that's how most of my jewelry is - but then again, enameling is working with fired glass and glass can break. Take care of your Blooming Enamels jewelry like you would take care of a small piece of glass -- no aggressive throwing or dropping on hard surfaces. Packaging is the icing on the cake (and who doesn't like icing?!) therefore I send everything I make in a small decorative tin which is then placed in a mini pouch bag. I also have gift boxing available which includes a Blooming Enamels gift card printed with your special personal message. I will only use your shipping, billing and contact information to 1) communicate with you about your order and 2) to fulfill your order.